Newsflash: Muhammad will sit at the right hand of God on Judgment Day! Muhammad suffered numerous psychological disorders, not the least of which was grandiosity, a pathological drive to aggrandize one’s importance. The strongest evidence for this is that he preached that he will be with God on the Day of Judgment to “intercede” in deciding who is spared the flames of hell or who gets released from the furnace and allowed into paradise–God’s right hand man, so to speak. He will carry out this role as barrister for the faithful either while in prostration before the Lord or seated in a mini-throne next to God. Ever the modest prophet, he was never sure about which way it will be. Read this article and you will find out what gets crammed into the typical Muslim head and leads them to do the strange things they do, such as saying “Peace be upon him” at every mention of Muhammad’s name. The following is taken from the chapter “Intercession” from the book, It’s All About Muhammad, A Biography of the World’s Most Notorious Prophet. Footnotes citing the original literature of Islam are included to show that none of this is made up. LIKE A GENERALISSIMO WITH A CHEST FULL OF MEDALS AND RIBBONS, Muhammad awarded himself a breathtaking sweep of titles over the course of his career as self-anointed prophet. Muhammad terrified people with visions of sadistic torture in hell. 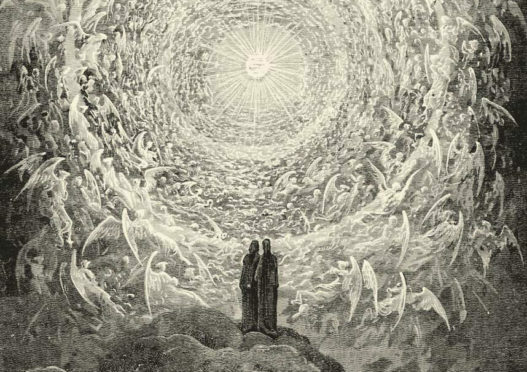 His gruesome descriptions of eternal torment made their way into Christianity via Dante’s Inferno, the first part of his epic poem, the Divine Comedy. WHAT SAYEST THOU, MUHAMMAD? Muhammad told his followers that he will intercede for them with Allah, but in order for that to happen they must continually pray for God to give him the right of intercession over them. They must also pray for Muhammad so that he will be able to recognize them on Judgment Day. This is why Muslims say “peace be upon him” at every mention of Muhammad’s name. Muhammad’s imagination went to work constructing scenes of his role on the Last Day. 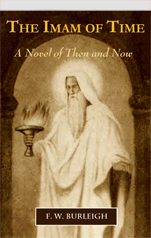 In sermons, at small group sessions, during dinners with his closest people, in meetings with tribal leaders who came to Yathrib to take the oath of fealty, or while on the road with nothing but conversation to break the tedium, he talked about the end times and what the faithful should expect: It will begin, Muhammad asserted, when the Angel Israfil blows a trumpet to announce the time for resurrection has arrived, a blast so powerful it will be heard throughout creation. By then the earth will be a desolate ruin where life no longer exists. But through the intervention of God, all the dead will be raised and reconstituted in the flesh, as naked as when they were born, though in appearance they will be as they were when they died. Their bodies will be reassembled at the plain of the great Pond of Abundance, an immense body of water thousands of times larger than the lake created by the fabled dam of Marib. The location of the assembly has a name: the Place of Gathering, and Muhammad is “The Gatherer.” He will be the first to be resurrected and he will arrive dressed in a resplendent green garb and wearing a green turban—the only one of the resurrected to be clothed, and that will be in honor of the modesty he displayed throughout his life. He will stand atop a hill like that of Arafat, or he will enter riding a horse, proudly carrying the Banner of Praise and Glory to symbolize the honor God has bestowed upon him by raising him to the highest station in Paradise, second only to the throne of God. Muhammad was never at a loss to add details. At a banquet he once held forth on the theme of his superiority over the other prophets and went through the prophet list from Adam to Jesus. The scene was a typical banquet setting: A huge leather sheet that served both as table and table cloth had been spread out on the floor and the guests were seated cross-legged around it. They were served meat, bread, and soup while Muhammad was brought a roasted leg of mutton, his favorite dish. Holding it in his hands, he alternated between tearing at the flesh with his teeth, chewing, and talking. The subject of the Last Day had come up and guests were asking him questions about the right of intercession of the other prophets. Won’t they have the right to intercede as well? While still chewing, Muhammad shook his head. “I shall be the leader of all mankind on the Day of Resurrection.” Looking around at his guests, he said, “Do you know why?” When the perplexed guests said nothing, Muhammad became irked at their lack of etiquette. There were rules to follow in conversing with God’s representative on earth. He said, “Why don’t you say, ‘How would that be, O Messenger of God’?” His compliant guests then said, “How would that be, O Messenger of God?” After taking another bite of mutton, he explained that the other prophets would eagerly yield their right of intercession to him because God had granted him superiority over them, which meant that he would then intercede on behalf of all the children of Adam, not just his own followers. In effect, that meant all mankind, since everyone descended from Adam. Modestly, he admitted that he would not be the only intercessor; he would only be the first, and he would be allowed to intercede for the greatest number. After him, the other prophets would be permitted intercession as would angels and even humans who had gained intercession rights for their family members as a result of their good deeds in the cause of God, such as being wounded in battle or killed while fighting for the cause. Muhammad was one of the greatest hellfire salesmen who ever lived. Once he got people to believe in the existence of hell and that he could spare them from its blistering torments, he gained total control over them. He gave a rundown of how his superiority will be acknowledged: On the Day of Resurrection, God will delay the Great Adjudication and he will do it to cause confusion among the multitudes, the generations of people going back to the time of Adam who will be waiting in anguish to learn of their fate. God will cause the sun to come close, making the people sweat as they had never sweated before. They will become nervous, thinking that the delay meant God was angry with them. This will move them to petition various prophets to intercede with God for them, starting with Adam. It could be called the Bridge of Triage, for here will occur the separation of good people from the half-good, the not-even-half-good, and the all-bad. Muhammad will cross it as swiftly as a bolt of lightning as will those earmarked for Paradise, but the bridge will be treacherous for everyone else—full of booby traps for sinners, he tells his audience. Sharp hooks will latch onto people and chop them up before throwing them into the pit of fire below. People will try to crawl on all fours to get across, hoping to slip underneath the hooks, but it will be of no avail; they will be grabbed and thrown down. Idolaters in particular will be snagged and sliced up before being thrown into the fires where they will roast for eternity, but others will be cast into Hell pending rescue through Muhammad’s intercession with God. This is when the first phase of his intercession with God will begin, Muhammad affirms, when he becomes the lifeline of salvation. On the Day of Judgment he will first pray for blanket forgiveness for his followers, even for those who merited Hell. He will raise his face to the Lord and cry out, “My ummah, O Lord! My ummah, O Lord!”—his ummah meaning his nation, the transtribal supertribe of believers. He will pray for God to spare them from the torments of the fire, even if deserved. God will accept this initial request, but only for seventy thousand, and he will give permission for them to enter Paradise through a gate specially built for them. They were the ones who made it across the bridge over Hell. They were allowed to cross because God in his foreknowledge knew they were those whom he should immediately forgive because of Muhammad’s supplications. The seventy thousand, therefore, will go through the gate of Paradise without having to give God an account of their actions in life. Then comes the main event. Muhammad will rescue many of the sinners who were pushed off the bridge. These are people who had at least a grain or even an atom of faith in God and his messengers, but whose deeds in life merited punishment, though not eternal damnation. They will be made to suffer the torments of Hell, and it will not be short term. A day in the afterlife is the equivalent of fifty thousand earth years, so even if only condemned to a day in Hell, they will suffer excruciating tortures for a thousand times the length of time they spent on earth doing the things that merited such punishment. Their bodies will be roasted to the point of charcoal, only to be regenerated so they can be roasted again. Every part of the body will be consumed by the flames, the only exception being prayer marks on the forehead. The foreheads of those who touched their heads to the ground in prayer ritual will be spared, but not all the forehead—only the part that actually touched the ground, a roundish portion about the size of a large coin. Those prostration marks will make them easy to recognize as salvageable sinners. Muhammad used to tell his audiences that when the time for intercession comes, he will throw himself in prostration before the throne of God and pray for the release of these sinners. God will say, “Raise your head, speak and you will be heard, intercede and your intercession will be accepted.” In some versions, Muhammad is seated in a throne next to God—the Station of Praise and Glory. Despite the honor shown him, Muhammad’s intercession will still not be a guarantee of rescue. God will show his mercy to whomever he pleases, and at his command the angels will pluck out of Hell whomever he pleases to pluck out. Whatever their shape or condition at that moment—charbroiled or burnt down to a skeleton—angels will bring them to the River of Life whose waters will cause them to regenerate into human form. From there, they will be allowed into Paradise, but being rescued sinners they will have to enter Paradise from the lowest gate, and they will reside in the lowest parts of the celestial realm. Muhammad always got a kick out telling the final act of the intercession story. This was his last-man-out-of-Hell story, the tale of the last mortal to be rescued from the fire. 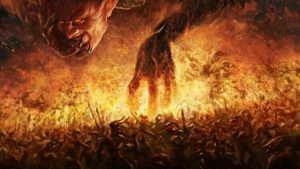 The last man out of Hell will crawl out of the pit of flames, and God will have some fun with him by asking if he will be satisfied merely with getting his body back and being spared any further torment. When he replies, “Yes,” God will say, “Will you ask for anything more in case this favor is granted to you?” He agrees not to ask for anything more; just being spared any further blistering torment would be good enough, thank you. After the body of the last man out of Hell is restored in the River of Life, God will tease him by allowing him to go up to the gate of Paradise, but not enter. This will make the man’s heart ache because through the pearly gate he will get a glimpse of “the life, charm, and pleasure of Paradise.” He will be so torn by what he is denied he will cry out, “O my Lord! Let me enter Paradise.” God will say, “O son of Adam! How treacherous you are! Haven’t you made covenants and given pledges that you will not ask for anything more than what you have been given?” The last man out of Hell and God go back and forth. The man keeps asking for more. By the end of it, the last man out of Hell is finally allowed to enter Paradise, and God tells him he can have ten times more than he wanted as a way of showing the extent of his mercy towards even the lowliest creature. This lowly creature evidently has a big appetite for real estate, for he tells God he wants a lot of space for himself, as big as the earth, and God cheerfully gives him ten times the size of the earth! This was the punch line, and Muhammad throws his head back in a hearty, open-mouthed laugh, then looks around to see if everyone got it: The lowest of the low would be allowed to enter the lowest part of Paradise, and look how enormous the lowliest part of Paradise will be for the last man out of Hell—ten times the space of the earth! With that, Muhammad again throws his head back and roars with laughter. Many, perhaps even most, of the children of Adam will be doomed to eternal fire, and no amount of interceding will help them. These are the polytheists, the hypocrites, the apostates. Muhammad did not spare any heathens from Hell, not even his mother or the kindly Abu Talib who took him in when he had no one to care for him and raised him like a son. He made it known that he would intercede with God to raise Abu Talib from the depths of Hell reserved for idolaters to a higher station where only his feet would burn up to his ankles. That would cause his brain to boil, but at least it would not be as painful as the torments inflicted in the lower depths. As for Muhammad’s mother, there was no hope. She had lived and died a polytheist. Bound for Hell too are Christians and Jews, though presumably they would benefit from the intercession of Jesus or Moses. In Muhammad’s reckoning, Jesus and Moses were second in rank to him. They would also have the right to intercede with God on behalf of their faithful, but only after he finished his own labor of intercession. 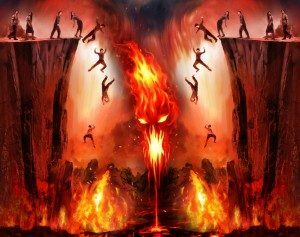 Unlike the others, the Jews and Christians will not be pushed into the flaming pit while crossing the bridge over Hell, but will fall over a cliff like lemmings while running toward a mirage of water in the hope of quenching their thirst. Muhammad crafted the mirage imagery to symbolize what he thought were Christian and Jewish false beliefs about the nature of God. The chief sin of the Christians was their belief that Jesus was the son of God, a form of idolatry. Muhammad never tired of explaining the illogic of the Christian belief: By virtue of being the one God, God could not have a son or a wife. He also accused the Jews of worshipping one of their prophets, Uzayr, as the son of God. For this they would also be punished. Muhammad ended his storytelling with further self-aggrandizement: When the Great Adjudication is completed, when the last of the saved have been plucked out of Hell and have taken their place in Paradise, and when the eternally damned realize there will never be any hope for them, Muhammad will take up his own abode in Paradise. His quarters will be at the top of the Seventh Heaven, above all the other prophets, closer than anyone else to the throne of God. There in praise and glory he will reside for eternity. 2. 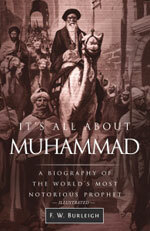 Evidence of Muhammad’s pathological drive to aggrandize his importance—grandiosity is the word for it in psychiatry—can be found throughout the literature, as in the array of titles he gave himself, but nowhere is it more clearly shown than in a tradition attributed to Abdullah, the son of Muhammad’s uncle Abbas. Abdullah reported, “I posed the following question to the Messenger of God, ‘Where were you, may my parents be your ransom, when Adam was still in Paradise?’ He replied, smiling so broadly all his teeth could be seen, ‘I was in his loins. Then the vessel carried me into the loins of my father Noah, who cast me out into the loins of my father Abraham. My parents never once engaged in fornication. God went on transporting me from respectable loins to chaste wombs, pure and unsullied, and whenever a line split I was always in the better half. God has covenanted prophethood in me and made Islam my pact. He made mention of me in the Torah and in the Bible. All the prophets made clear my qualities; the earth brightens with my light and the dark clouds with my face. He taught me His Book and gave me honor in His Heaven. He cut off for me one of His own names; the Enthroned One is Mahmud, while I am Muhammad and Ahmad. He promised me that He would reward me with a garden and with al-Kawthar, the river of Paradise, that He would make me the first intercessor and the first for whom there was intercession. He drew me forth, moreover, out of the best marriage for my people, and they are those who give much praise, enjoin good deeds and prohibit sin.’”—The Life of the Prophet Muhammad, by Ibn Kathir, vol. 1, p. 140. Despite the absurdity of these claims, his own unshakeable belief in these grandiose ideas about himself convinced many people that they were the truth. 3. A tradition in Sahih Muslim attributed to Abu Huraira states: “The Prophet of Allah (may peace be upon him) said: ‘There is for every apostle a prayer which is granted, but every prophet showed haste in his prayer. I have, however, reserved my prayer for the intercession of my Ummah on the Day of Resurrection, and it would be granted, if Allah so willed, in case of everyone amongst my Ummah provided he dies without associating anything with Allah.’”—Sahih Muslim, trad. 389. Ummah, also spelled umma, is the collective word Muhammad used for his followers and can be roughly translated as his “people” or as his “nation” of believers—the transtribal supertribe of his followers. 4. In Muhammad’s own words: “Then ask Allah to grant me Al-Wasilah, which is a status in Paradise to which only one of the servants of Allah will be entitled, and I hope that I will be the one. Whoever asks Allah for Al-Wasilah for me, it will be permitted for me to intercede for him.”—Tafsir Ibn Kathir, vol. 8, pp. 38-39. Al-Wasilah refers to Muhammad’s idea of the highest station of Paradise, the Station of Glory and Honor. 6. Sunan Abu Dawud, trad. 2769. 7. Sahih Muslim, trad. 379. 9. In many of the accounts, Muhammad is not on a horse, but is standing on a hill that allows him to observe the multitudes. In this case he presumably leads mankind across the bridge over Hell on foot. 10. Zoroastrianism, a religion that preceded Muhammad by more than a thousand years, warned of the Chinvat Bridge—“the bridge of judgment”—in the afterlife that crosses over Hell and is the place where evil people are toppled into eternal damnation. Muhammad’s Hell bridge was evidently inspired by this teaching. It is likely he learned of the Zoroastrian belief from one of his closest followers, Salman the Persian, a Zoroastrian turned Christian turned believer of Muhammad’s religion, who often spent hours with Muhammad discussing religion. 11. Muhammad’s imagination knew no bounds, as this tradition about the depth of Hell reveals: “Abi Huraira reported: We were in the company of Allah’s Messenger (may peace be upon him) that we heard a terrible sound. Thereupon Allah’s Apostle (may peace be upon him) said: ‘Do you know what (sound) is this?’ We said: ‘Allah and His Messenger know best.’ Thereupon he said, ‘That is a stone which was thrown seventy years before in Hell and it has been constantly slipping down and now it has reached its base.’”—Sahih Muslim, trad. 6813. 12. Sahih Muslim, trad. 349. 14. Tafsir Ibn Kathir, vol. 2, p. 27. 15. 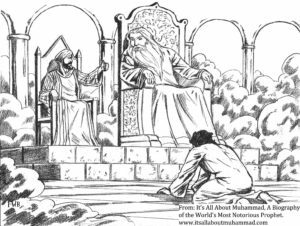 Muhammad is the “Enthroned One”—one of the titles he gave himself. 16. A version of the story can be found in Sahih Muslim: “Abdullah b. Masud reported that the Messenger of Allah (may peace he upon him) said: I know the last of the inhabitants of Fire to be taken out therefrom, and the last of the inhabitants of Paradise to enter it. A man will come out of the Fire crawling. Then Allah, the Blessed and Exalted, will say to him: Go and enter Paradise. So he would come to it and it would appear to him as if it were full. He would go back and say: O my Lord! I found it full. Allah, the Blessed and Exalted, would say to him: Go and enter Paradise. He would come and perceive as if it were full. He would return and say: O my Lord! I found it full. Allah would say to him: Go and enter Paradise, for there is for you the like of the world and ten times like it, or for you is ten times the like of this world. He (the narrator) said: He (that man) would say: Art Thou making a fun of me? or Art Thou laughing at me, though Thou art the King? He (the narrator) said: I saw the Messenger of Allah laugh till his front teeth were visible. And it was said: That would be the lowest rank among the inhabitants of Paradise.”—Sahih Muslim, trad. 359. 17. Sahih Al-Bukhari, trad. 3885. 18. Ibn Kathir, Life of the Prophet Muhammad, vol. 1, p. 169. 19. Muhammad never admitted that he had erred in his understanding of the Christian concept of the Trinity. In his mind, Christians believed Mary the mother of Jesus was one of the persons of the Trinity. His idea about Mary as God’s spouse was shaped by logic. How could God have a son without having a wife? 20. Muhammad also had a misconception about Jewish beliefs. He erroneously believed the Jews took their prophet Ezra, whom he called Uzayr, as a son of God.